If you are experiencing hair loss you are probably familiar with the vast amount of hair loss treatments out on the market claiming to regrow your hair. Some treatments can help restore hair loss while others have harmful side effects or ingredients that irritate the scalp causing dandruff, dry scalp, or allergic reactions. Is there such a treatment for hair loss that is drug free that actually regrows hair without all the harmful side effects? Low level laser therapy has become popular in medical offices, hair restoration clinics, and hair salons to help promote hair growth for people experiencing hair loss, specifically for people experiencing androgenetic alopecia. Androgenetic alopecia is a progressive type of hair loss that affects the crown, front, hair line, and temporal areas of the scalp. Over time hair follicles produce fine, thin, light colored hair. These fine, light colored hairs are called villus hairs. They become thin because of a process called miniaturization. During the miniaturization process normal, healthy hair is choked by dihydrotestosterone also known as DHT. DHT shortens the hair growth cycle creating thin textured hairs. Over time hair follicles affected by Dihydrotestosterone may close and the scalp becomes noticeable. One of the benefits of low level laser light therapy is to reverse miniaturization causing hairs to regrow fuller and healthier from the hair follicle. Before we discuss the benefits of low level laser light therapy lets define what it is. What does this theory have to do with laser light promoting hair growth? Light from the laser device produces energy to the cells of the hair follicle which helps the hair follicle cells perform at their best and produce healthy strands of hair that create a thicker, fuller appearance. This is a non-invasive laser treatment that does not burn or cut the skin. It has been used successfully in Europe for over 30 years and has no known side effects. The results of low level laser therapy vary from one to person to the next. It is not a miracle. If you decide to have laser therapy you should consult a dermatologist, trichologist, or hair transplant surgeon to learn your options and to help make the proper decision about laser therapy. Laser therapy for hair loss works well with a combination of other treatments. Treatments recommended may include the taking of oral medications or DHT inhibitors such as Finasteride also known as Propecia for men. DHT Inhibitors may be recommended to use with laser light therapy because they retard the hair follicle miniaturization process. A trichologist may recommend taking a supplement with herbs that block DHT naturally such as saw palmetto and green tea extract. You should always ask your doctor before you take these supplements to make sure it is the best and safest option for you. Topical treatments such as Rogaine, also known as minoxidil, may be prescribed to use with laser therapy to optimize hair growth results. Hair growth is possible as long as follicles are present on the scalp. Area’s on the scalp where you have more hair follicles will respond well and you may see more hair growth because of low level laser therapy, but areas on the scalp where you have fewer follicles will produce less hair. Low level laser therapy can also help contain your hair loss so that the area in question does not grow in size. You have to be consistent. When using laser therapy for hair loss or other scalp problems, you need to know that you will have to use the light therapy as often as three times a week, for 15 to 20 min. per session. It is recommended to skip days in between laser therapy sessions. You will also be required to use laser therapy forever. The minute you stop using the therapy, any results you see will be lost and you will eventually have the amount of hair loss you had before you started the laser therapy. Laser therapy works best in the beginning stages of hair loss. The earlier you start the therapy the more success you will have. This treatment is not one size fits all and it is important to understand the type of hair loss you have first before you purchase a laser device for hair loss or a laser therapy package from a hair loss clinic. 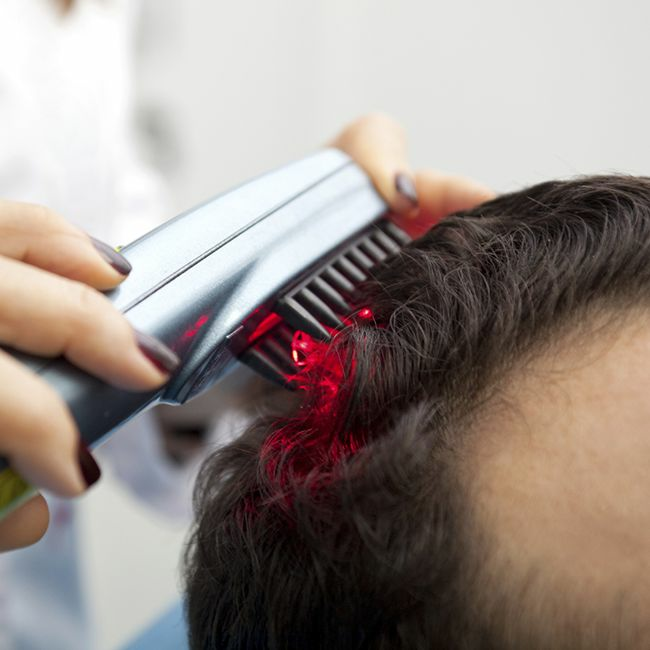 Laser therapy for hair loss can be pricey if you go into a hair restoration clinic or hair salon for the therapy. Prices could range from $1200 to $3500 a year for treatment inside a location but there is no guarantee that you will get hair growth results. Many doctors and trichologist believe more research is required to prove how well low level laser therapy works at promoting hair growth.